NMTronics is a market leader in high technology equipment domain, with a responsibility to bring & integrate worlds' best technology solutions in Indian manufacturing industries. We are a 100% subsidiary of Sojitz Corporation Japan, & were incepted in 1999. Being part of a large conglomerate like Sojitz, our biggest attributes are our customer-centric approach which is reflected in our day to day business of Sales & Service of world class manufacturing equipment. We are focused into SMT, Solar, Industrial Automation & Skill Development sectors. We have highly specialized team working in each of these areas, with thorough knowledge of products and processes, to realize best suitable solutions & services for our customers. Our headquarter is located in Noida, India. Thanks to the success of our customers all over India (and around), we have a pan India Sales & Service network. In over 20 years of history of NMTronics we have seen many opportunities & many challenges. Each incidence has helped us to become more learned & prepared us to overcome the upcoming challenges to embrace opportunities. The key learning is that we must accept change & transformation. Change requires leadership, courage, and open culture while Transformation requires Honesty, Trust and Collaboration. The biggest achievement for us in these 20 years is that we are looked upon as an inspiration in our industry, a tall task which has been possible only due to hard work & contribution from everyone who has been a part of our journey. We hope to have Sustainable Success & growth for our Shareholders, Customers, & Employees Welcome to NMTronics! Provide Worlds Best Technology & Sustainable solutions to our customers in the most cost effective way so that we can grow together. To Continue Sales & Distribution Leadership with 100% customer satisfaction by providing Single Window Solution to SMT & SOLAR manufacturing industry with world-class equipment manufacturing companies. Born in August, 1967 to a family of technocrats. He completed his schooling from the best of the schools in eastern territory of India, where his father was heading a Sugar Factory, and later a reputed public sector enterprise in Drugs & Pharmaceuticals. He is a Mechanical Engineering Graduate and holds a Post Graduate Diploma in Marketing Management from a highly recognised management school, in New Delhi. Since childhood, He cherished a dream to lead an enterprise [public, or private sector] following in his fathers' footsteps. He Initially started his career as an Executive Engineering Trainee with Crompton Greaves Ltd. [the flagship company of the erstwhile Thapar Group ]. Earned laurels right from the outset of his career and gradually gained acceptance asa potential future manager. He joined the "Nagoya Machinery Department" of NICHIMEN Corporation - TOKYO, in the year 1996 and was posted on an assignment at Fuji Corporation (formerly FUJI Machine Mfg. [Europe] Gmbh. - Germany). In FUJI European Business,he was associated with the Technical, Sales & Management departments. After a few years of gaining expertise and successfully delivering results in the reliable German engineering background, he shifted back to India. In1998, he re-joined Nichimen Corporation New Delhi Liaison office, and started the SALES & SERVICE activities of FUJI SMT Machines in the Indian Sub-continent. A year later he introduced the concept of organized business of machine & equipment supply to the SMT industry in India by establishing NMTronics India Pvt. Ltd., on behalf of NICHIMEN Corporation. NMTronics India Pvt. Ltd. is dedicated to provide 24x7 sales, service support and consultancy services to EMS manufacturers in India, which was a step forward in the business vertical. 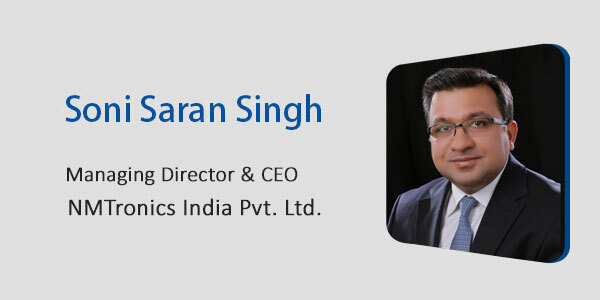 Mr. Singh has successfully led NMTronics for over 16years to bring it to its present leadership position in the electronics manufacturing machine & equipment's supply business in the Indian sub-continent. Mr. Soni Saran Singh as the Executive Director of NMTronics India reports to the Board of Directors at SOJITZ Corporation - Tokyo. In 2005, he initiated the formation of another JV with Ellipsiz Corporation - Singapore and established the company "iNETest Technologies India Pvt. Ltd." iNETest has established its identity as a premier test / Inspection equipment sales, service and distribution business in EMS, and gained its reputation as #1 Stringer supplier in SOLAR Module Manufacturing segment. iNETest has also engaged as EPC partner in Solar Power Projects. Mr.Singh is the Managing Director of iNETest Technologies India Pvt. Ltd., head quartered at the Gurgaon, and it presently part of Global Technosoft Pte. Limited – Singapore. 2009 saw NMTronics successfully diversify into the Solar business and achieve the status of one of the preferred business partners in the segment by representing few of the module & cell manufacturing technology suppliers of global repute. He is currently leading a team of 10 managerial employees reporting to him. He oversees operations of branch offices which represent 30 principals from various countries, in all major EMS hubs in India. He is a globe-trotter, and visited 40+ countries all across six continents. He enjoys watching movies with his wife, and plays golf with his business associates. Born in May, 1972 in Mumbai in conservative middle-class family, he completed his schooling in Mumbai , where his father was working in Bank. He is an Electronics Engineering Graduate from reputed government engineering college in Mumbai, passed out in year 1993. Since childhood, he only dreamt of becoming an Electronics Engineer and always loved to be surrounded by machines. He Initially started his career as Trainee Engineer with Videocon International Ltd, Aurangabad in Tuner division and was born & brought-up in Surface Mount Technology. Having worked for two years in Videocon in manufacturing, he got an opportunity to work in Philips India Ltd, New Delhi as Service Engineer for SMT placement machines in year 1995. He travelled frequently to Holland and Singapore for getting hands-on exposure on machine manufacturing process and advance machine maintenance. He rose to the position of Service Manager within five years of joining Philips. In 2001, he shifted back his career to manufacturing field and joined Celetronix India Pvt. Ltd., Mumbai as Manager - Engineering. After a few years of successfully delivering results, he became the Engineering Head and within three years, rose to the position of Asst. General Manager - Engineering. Having worked for 7 years in Manufacturing field and 6 years in Service Support field, he decided to be back in the service support field in year 2006, by joining NMTronics India Pvt. Ltd., undisputed leader in SMT sales & service support field in India. 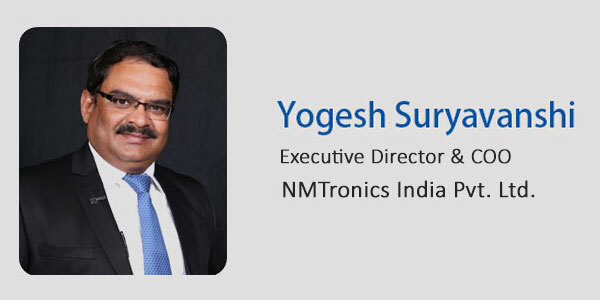 Mr. Yogesh has successfully led NMTronics Service Support for over 10 years and feels very proud of establishing NMTronics as No. 1 company in India for "Best Service Support" of SMT machines. He report to Mr. Soni Saran Singh, Executive Director of NMTronics India. He is currently leading a team of 7 managerial employees reporting to him. His wife works for NGO in Mumbai and he is blessed with one son. He enjoys travelling, working on laptop and playing cricket with his son. Ravinder Bhardwaj was born in June, 1979 & has done his schooling from Delhi. Since childhood he was curious towards Machines, Robotics & Automation, which led him to study Mechatronics & Industrial Automation and evolved as an Automation engineer. 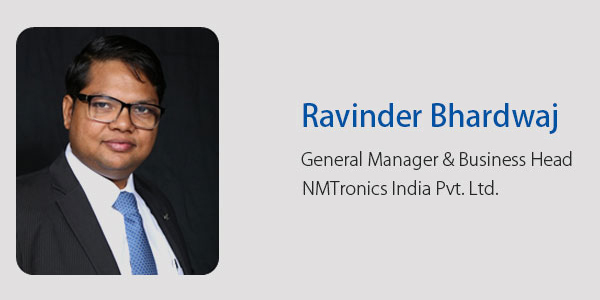 He has been an early member of NMTronics Family since 2001, and has been one of the major contributor to all key projects which catapulted NMTronics as No. 1 Technology Equipment supplier in India. During his long journey in NMTronics he has been part of Service, Sales, Technology & key management team. After a successful stint in SMT business for 8 years, he laid the foundation of Solar business in NMTronics in 2009 as a part of diversification objective. Within a short span of time, he was able to establish strong relationship with global leaders in Solar Cell & Module Technology providers & established NMTronics as No. 1 equipment supplier for Indian Solar manufacturing companies with an installation base of over 2 GW & a market share of 40%. He is currently head of Solar Business Unit while simultaneously evaluating new markets of growth for NMTronics India. Garima Singh was born & brought up in Holy City Varanasi popularly known as Kaashi in a traditional working class family (her father was a Banker & mother was an Architect ). She was born on January 1982. Her background & upbringing in city like Varanasi have inculcated a sense of strong human connect which has been her strength area. She was science scholar but decided to pursue Geography Honours from esteemed College, Banaras Hindu University (BHU), she was rank holder & graduated in the year 2001, Post that she completed her full time MBA in HR in 2003. She started her career with a Resource Management & Staffing company from which she was handpicked from one of her client “JBJ Perfumes” to lay down HR & Staffing process at their newly built Manufacturing Plant. Post that she served Netambit Info source private limited as Chief Manager HR & before Joining NMTronics she spent close to 5 years as Senior Manager - HR in Dish TV India Limited (Essel Group venture). She joined NMTronics in 2016. In a way she was lucky to work in diversified product/Service organizations with different work culture & process which helped her to become a seasoned HR professional. She has Progressive experience across the entire gamut of workforce management from workforce planning, Talent Acquisition to Talent Development, Retention and with all stages of People Life cycle in organizations. She has rich experience as a Functional Specialist and Leader in Performance Management, Talent management and engagement. Special strength and experience in, HR process automation and as a Business HR. With 14 years of experience she now has Strong Leadership skills & a clear focus on strategic orientation, tactical approach and operational excellence in working with different size & scale of operations from start-up organization to establish global leaders. 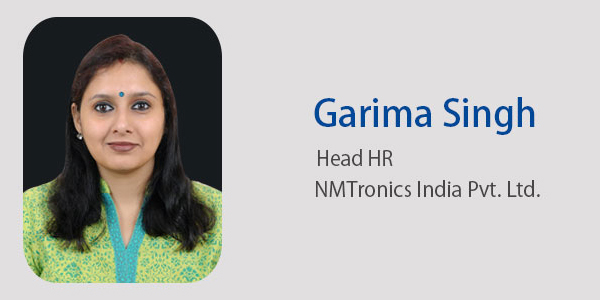 Ms.Garima Singh is Heading HR department of NMTronics & establishing best HR practises. She reports to Mr. Soni Saran Singh, Executive Director of NMTronics India Pvt. Ltd. Her Husband works as Sales Head in a leading US MNC and she is blessed with two Sons. She enjoys reading novels & story books, meeting with people & travelling.